I heard California got a lot of rain this season, all the news talked about it when I was in France and I heard it from my neighbors when I got back. The good things is that it’s clearing up. Eventhough France was very cold with -10C temperatures some days, my mom never made soup and neither did I. Of course during the holidays, we tend to eat “holiday meals” and strangely enough soup is not entitled to the be on the “holiday” list, so I somehow missed it. One soup I really like is this cauliflower soup with chick peas and small pasta, you can put potatoes instead of the pasta, or even both. You can use any small pasta such as quadretti (little squares), ditali (small cylinders) or any small pasta to be used is broths or soups. I had none left so I cut some fettucine into small pieces, and it worked quite well. The difference is that quadretti are a egg pasta and thinner than fettucine which are not supposed to be used in soup as per the pasta étiquette. So I went against the étiquette, nonetheless it was really enjoyable. I think some ingredients can be substituted and some others, cannot. In this case, I would say it could be. I am not sure how the word “pasta” is used in the US, if it refers to a particular pasta dish cooked in a particular way and not in soups. Then not sure what the word “noodle” refers to either, so I will try to be as accurate I can be. For me noodles reminds me of the Asian pasta, and not Italian pasta. Every kind of pasta in Italy has its own name, that makes it quite easy to what type of pasta you are talking about. Heat olive oil in a large pot, brown onions, then add garlic, stir a few minutes. Add tomatoes, cook for about 5 minutes to let the water evaporates, then add potatoes, cauliflower and rosemary. Stir well to coat all the vegetables and cook for about 7 min stirring. Add enough broth to cover the vegetables (you might want to add extra to have enough liquid to cook the quadretti). Let it cook until the vegetables are tender but not mushy, remove rosemary then add chick peas. Cook for another 10 minutes. Add pasta and 1 garlic clove and cook until desired texture (I like them al dente). Sprinkle with olive oil, cracked pepper and serve. This entry was posted by silvia on January 31, 2010 at 8:46 am, and is filed under Soups, Vegan. Follow any responses to this post through RSS 2.0.You can leave a response or trackback from your own site. Beautiful soup, and perfect for a rainy day! Cavolfiore is my favorite winter vegetable. 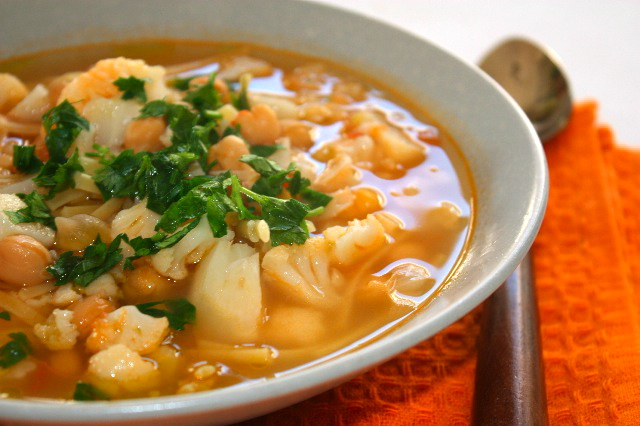 I was looking for a soup using cauliflower that wasn’t a cream base, and this fits the bill! I lost your blog few days ago! Just linked it back to my blog again this morning, so that I could catch up with you without going through FB. Still unable to get use of the new FB sites. Quite frustrating! This soup sounds light & colourful. Guess, you had a fabulous time back home huh! I’m sure you still miss home a lot. Have a wonderful day. Cheers. This is a nice soup to have. Cauliflowers are cheap right now so this would be a great recipe to do. Combines three of my favorite ingredients–cauliflower, ceci and pasta. What’s not to like? Sounds delicious! o,silvia,it’s look so delicious!i love the ingredients and it’s sure :this is my next zuppa!it’s sound so refreshing! Hi Silvia, I called my friend stacey and asked her for a cauliflower soup recipe and she recommended yours. I followed your instructions and the soup came out amazing! My friends and I really enjoyed it and I wanted to Thank you so much!